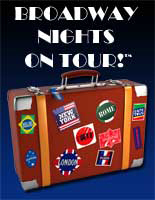 Takes your audience on a fanciful, whimsical world tour. The trio ‘travels’ from Broadway to turn of the century Russia; takes a riverboat ride on the Mississippi, skips back across "the pond" to 'Olde London', on to the Far East, back to Paris, New York, Havana, and finally, back to New York! Review: What you get with Broadway Nights is glorious singing from the people who have been there. A Day in the Life...Three Phantoms in Concert Return!